A gentle learning toy that is eco-friendly, helps with reading skills, and is fun to manipulate? Sign our little learners up! 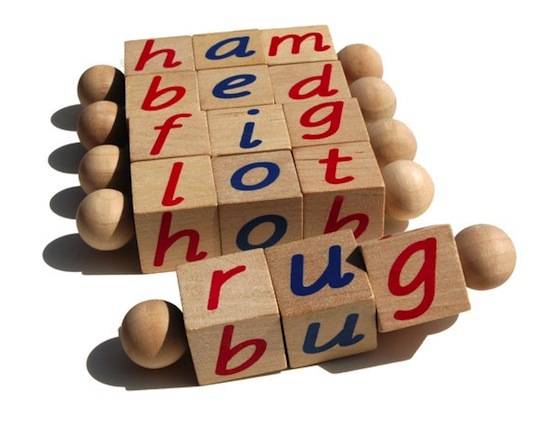 These Montessori reading blocks, with red consonants and blue vowels, encourage tots to try out different three letter word combinations with all five vowels as well as thirteen consonants. Beginning reading skills are strengthened as kids experiment with and learn 80 different words, many of which rhyme. Suitable for Montessori classrooms, these blocks are also a great kid’s toy to have around the house or for car or restaurant trips. Created by a certified Montessori teacher, the blocks are hand-crafted from unfinished maple wood, and finished with water-based ink and glue. A gentle learning toy that is eco-friendly, helps with reading skills, and is fun to manipulate? Sign our little learners up! These Montessori reading blocks, with red consonants and blue vowels, encourage tots to try out different three letter word combinations with all five vowels as well as thirteen consonants. Beginning reading skills are strengthened as kids experiment with and learn 80 different words, many of which rhyme. Suitable for Montessori classrooms, these blocks are also a great kid's toy to have around the house or for car or restaurant trips.�Created by a certified Montessori teacher, the blocks are hand-crafted from unfinished maple wood, and finished with water-based ink and glue.